How to increase your Net Promoter survey response rate | CustomerGauge How to increase your Net Promoter survey response rate to 60%+! How to increase your Net Promoter survey response rate to 60%+! The average marketing email clocks in a 3.4% response rate. In the world of customer survey emails, a 10% survey response rate is considered successful. But to paraphrase Sean Parker, a 10% survey response rate is no time to take your chips down. In fact, a 10% response rate isn’t even cool. You know what’s cool? Update: We wrote a full ebook about six copywriting strategies and included CTR increasing subject lines. A 60% survey response rate. This might sound like a total fantasy for a 40 question customer survey email, but for Net Promoter survey emails, it's much more realistic. In fact, several CustomerGauge clients have reached 60%+ response rates via email in part by acting on the tips below. If you want to drive your response rates to similar levels, read on! Before starting, consider the impact a survey will have on your customer. Is it relevant to survey someone the first time they visit your website? Is it intrusive? Are you and your customer best served by a transactional or relationship survey? Should you survey all your customers or only a segment? You are asking your customers for a favour, so it’s only polite to clearly outline what you are expect them to do, how much you value their assistance, and what you will deliver in return. Monitor and update your contact data across multiple touchpoints, including phone, in-store, or online, and use an email management system that helps you keep the contact data free of bounces, unsubscribes or old phone numbers. Clean data = higher response rates, especially for B2B, as people leave jobs and change email addresses more often than they change personal email addresses. The best time to survey varies, but for telephone support, ten minutes after a resolution has been reached on the phone is recommended, for ecommerce, a week after the transaction, so that customers have time to test their products. For B2B relationships, twice annually is generally considered advisable, staggered throughout the year, and so on. In a similar vein, optimal timing can vary by business, but we have discovered that sending surveys on Thursdays and Fridays often give a kick of around 3% for B2C. The average person spends three seconds on an email subject line and eleven seconds reading an email. Subject lines should be between 26-30 characters – that’s less than a third of a tweet! We find that simple subject lines such as “How did we do?” tend to perform quite well. 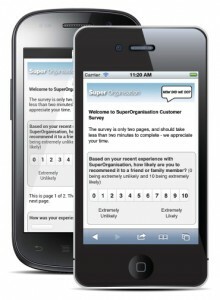 Make sure your survey is mobile-optimised. For B2C organisations, over 50% of survey targets are now reading their surveys on a mobile. And while B2B is still relatively low at just over 20%, it is still a significant percentage of potential respondents. Your survey design and layout needs to be optimised for different operating systems (especially iOS and Android), browsers, and devices, and look good on a variety of screens from a small smartphone to an iPad. Keep your survey as short as possible – every extra question drives down the response rate by 5-15%. Two questions is best, with response rates tending to decrease from that point on. A well-timed reminder a week or so after the original is sent can deliver up to 50% extra responses (example – 21% response from first email, 13% reminder after 7 days = 34%). Note: Don’t send second or third reminders – these tend to deliver little extra response, more unsubscribes, and unhappy customers – the opposite of what you are trying to achieve! 9. Don’t forget to say thank you! You’ve just asked your customers for a favour, so the polite thing to do is thank them and let them know what kind of feedback you received and ideally how you are acting on it. This is particularly important for B2B relationships, and can be done a month or so after the survey, when feedback has been received, analysed, and acted on. Nobody said a survey invitation had to be text. As 4G adoption rates increase and standing out from the clutter becomes ever more difficult, why not create a short NPS survey video invitation? Done well, a video can really bring the survey to life and communicate to customers how much their feedback is valued. A survey is a touchpoint in the customer journey, and an opportunity to demonstrate how much you value the customer’s role as a collaborator and stakeholder in your organisation. Communicate this well, and you stand to receive greater dividends than simply raw data.